Farmers around the country complain they find it difficult to sell their produce, for the third consecutive week. Farmers from Nuwara Eliya, Badulla, Bandarawela and Jaffna have produced an excess of vegetables, but the demand for them has lessened. Pettah Manning Market Secretary Gamini Handunge said that the market finds it difficult to sell the large supply received from the farmers as demand has dropped. “We are not able to pay the farmers the amount they are expecting. There were instances where we had to throw away produce because of this,” he said. According to Mr Handunge, a kilo of beans which was priced at Rs. 80, was sold below Rs. 60, a kilo of leeks priced at Rs.50, was sold at Rs. 30, and cabbage which was expected to fetch Rs 40 per kilo had to be sold at Rs 20. “Produce such as beet from Jaffna had no market,” he said, adding that he expects market prices to return to normal within a few weeks. During the past few weeks, a kilo of beet from Jaffna has been going for as low as Rs. 10 a kilo at the Dambulla market. “Jaffna farmers even stopped sending their vegetables to our market, as they didn’t profit from their efforts. It was the same with the Nuwara Eliya farmers,” said Dambulla Economic Centre (DEC) Chairman, U.B. Ekanayake. Farmers in Nuwara Eliya claim that the problem arose from climatic changes which took place in the area. which they failed to adapt to. They told the Sunday Times that last year, due to the same reasons, they had to sell a kilo of leeks for as low as Rs 5. The farmers added that vegetables such as carrot, cabbage and radish were spoilt and had to be either discarded or converted to compost. Agriculture Dept officers and Govi Jana Seva were blamed as they failed to advise the farmers on how to adapt to the climatic changes. This Thursday (27), at the DEC, a kilo of cabbage was sold between Rs. 20 and Rs. 30, carrot between Rs. 50 and Rs. 65, beetroot from Jaffna was sold between Rs. 7 and Rs.15, from Nuwara Eliya at Rs. 50, from Melsiripura between Rs. 10 and Rs. 20, radish between Rs. 8 and Rs. 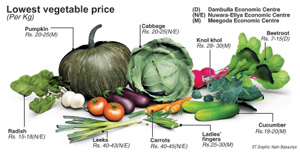 20, sweet potato between Rs 15 and 20, leeks between Rs 40 and Rs. 55, large pumpkins between Rs. 30 and Rs.50 and Malaysian pumpkin between Rs 12 and Rs.25. Meanwhile, at the Meegoda market, a kilo of beetroot was sold between Rs. 18 and Rs. 20, cabbage between Rs 28 and 30 rupees, carrot between Rs. 65 and 70, cucumber between Rs. 18 and Rs. 20, ladies fingers between Rs. 25 and Rs. 30, leeks between Rs 50 and Rs. 60, pumpkin between Rs. 20 and Rs. 25, radish between Rs. 35 and Rs. 40, and knol khol between Rs. 28 and Rs.30. Farmers are also facing hardship as they claim that they have borrowed money or pawned their jewellery to meet expenses to produce their crops. Ishara Weerasinghe (29) from Blackpool, Nuwara Eliya, who had cultivated four acres said that because of the change in weather patterns the farmers suffered crop failures. “Seventy per cent of my carrot harvest was destroyed. While I was able to produce 3,000 kilos of carrot last year, this harvest it was only 300 kilos, getting an income of Rs 6,000,” he said adding that, he suffered a loss of Rs 1.25 million. Weerasinghe says many farmers are reluctant to take up farming and even refrain from cultivating. “I pawned jewellery worth Rs. 500,000 to cover cultivation expenses , but the unexpected rains destroyed my harvest, and I couldn’t make a sufficient profit to redeem the jewellery,” said P. Ilangowan (38) from Labukele, Nuwara Eliya. He said he was able to produce 2,500 kilos of carrot, but the rain washed away most of it, leaving only 300 kilos. “The carrot I sold went for as low as Rs. 30 per kilo,” he said, adding that he has been disheartened and intends to stop farming in the future. Thilak Wijekoon (65) has been harvesting potatoes for two years. While agreeing with Ilangowan, he said that the demand for local potatoes decreased because the Government imported them. Now Wijekoon sells a kilo of potatoes for Rs 28. “I can’t recover the amount of money I spent producing them,” he said. Wijekoon who also cultivated carrots, obtained a harvest of only 400 kilos though he expected a yield of 1,500 kilos. “My income was Rs. 24,000, but my expenditure was over Rs. 30,000 including the cost of fertilizer and pesticides, I get no profit from my farming. Now I am in debt to many people,” he lamented.